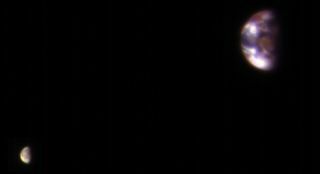 This view of Earth and its moon combines two images acquired on Nov. 20, 2016, by the HiRISE camera on NASA's Mars Reconnaissance Orbiter, with brightness adjusted separately for Earth and the moon to show details on both bodies. Relative sizes and distance are correct. Earth and Mars were about 127 million miles (205 million kilometers) when the photos were taken.